We’re peacock proud around BBS. 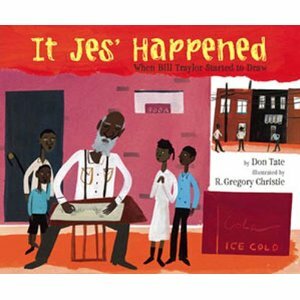 Team member and award-winning illustrator Don Tate celebrated the book birthday for his fantastic authorial debut last week: It Jes’ Happened: When Bill Traylor Started to Draw (Lee & Low). 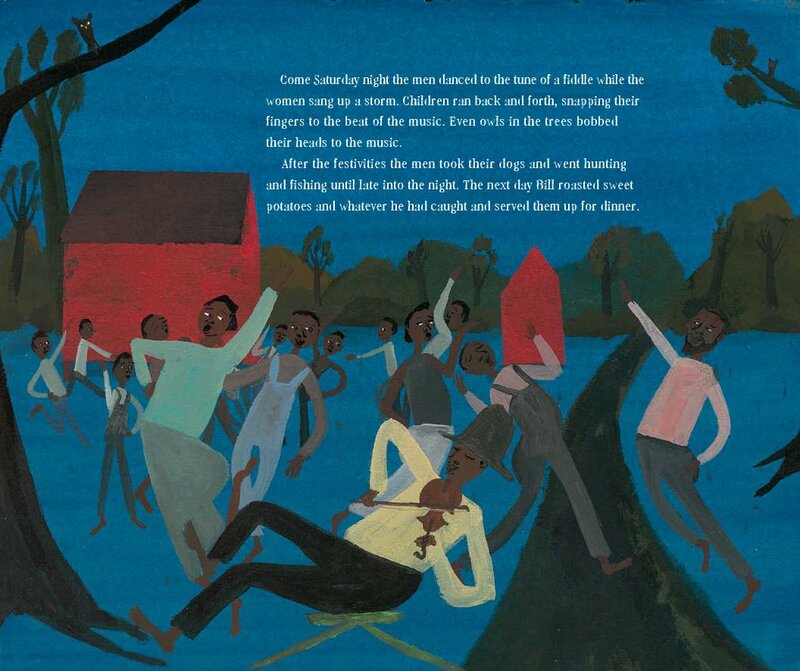 Already, the book, illustrated by R. Gregory Christie, has won big praise from industry journals. Kirkus and Booklist gave it starred reviews. 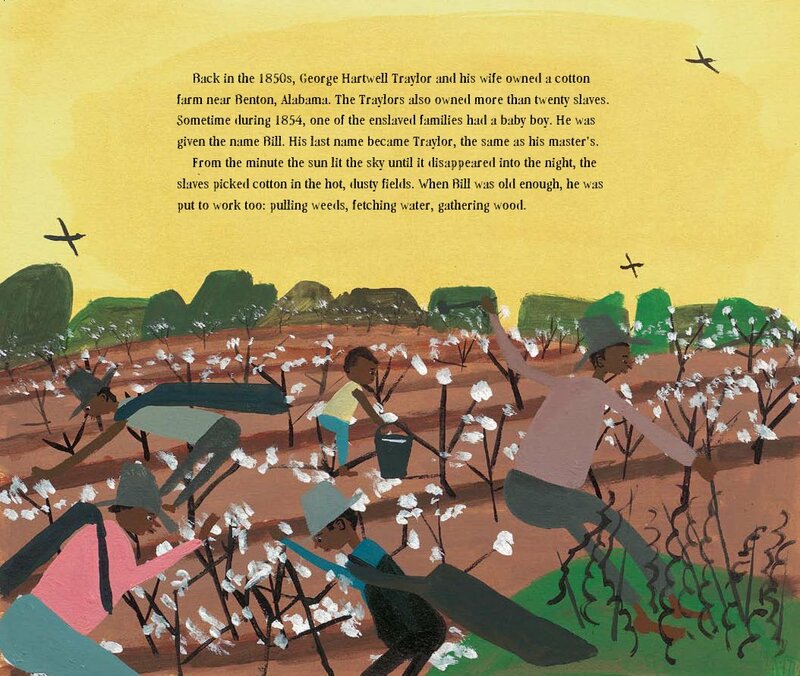 It’s a story that earned him Lee & Low’s New Voices Honor Award. Now, readers are finding out why. Don, illustrator of more than 40 titles, has a gift for writing too. We look forward to showing off more books written by our talented friend. What did winning the New Voices contest mean to you? How did you find out you won? Let’s talk about the New Voices award. In an effort to nurture new authors of color, Lee & Low Books hosts a writing contest. Writers of color are encouraged to submit their works. The top prize: $1,500 and a publishing contract. The honor recipient receives a $500 prize. I won the honor award. Needless to say, I was excited when I received the news. It Jes’ Happened was the first manuscript I’d ever pushed beyond an initial rough draft. Winning the contest was a huge confidence booster. That it arrived early in my writing career is what encouraged me to keep writing. Funny thing is, at the time, I was more confident in Bill Traylor than I was in myself. I knew Bill’s story would win editor’s hearts. Bill had an amazing story. Not because I wrote it, but because . . . Bill had an amazing story. I wasn’t sure if editors would find my writing as amazing. I was thrilled when they did. Because I truly believed that Bill’s story would win, I expected the phone call. Hope that doesn’t sound brazen, but I’m being honest. I fully expected to win. My editor was Louise May. I missed her phone call with the good news, but she left a long, detailed message on my voice mail. I saved that message and listened to it many times over the next few years. How did your story grow and develop through the editorial process? As the honor winner, I wasn’t offered a publishing contract initially. I was a little disappointed, I have to admit. The $500.00 prize was great, I used it to buy new art supplies. But I wanted Bill’s story to get published as a book. Not knowing if that would happen with Lee & Low, I began to share the manuscript with other editors. One editor rejected, suggesting that I try selling the story to AARP. I was so grateful when my editor at Lee & Low reassured me of her interest to publish once the story was strong enough to take to her editorial board. The revision process took a grueling 4 years. Revision was not the hard part, I thoroughly enjoyed that process. I learned so much! Waiting was what drove me bonkers. I worked in a newsroom. At a newspaper, stories are conceived, researched, written, revised, copy edited, illustrated and printed in less than 24 hours. I didn’t understand at the time why it took so long to revise a 1,000 word children’s book. I grew awfully impatient. Thankfully my editor was patient with me and always professional. I guess she was used to working with newbie authors. There were four rounds of revisions. The first couple of rounds, my editor raised a lot of questions that needed answers. Not because answers would be included in the story, but because I needed to know the answers in order to tell a more complete story. She also encouraged me to write a stronger ending to the story. I spent a lot of time perfecting the first few paragraphs, but towards the end I got lazy, I was ready to be finished. The last two rounds of revisions were spent rethinking word choices and tightening up. My editor reminded me to “be more specific.” I’d tend to talk – and therefore write – in generalities. I had all the details in my head, but it was important to get those details down on paper, and not to assume the reader would know the things that I knew. I also used colloquial narration voice, my voice. My editor was fine with my non-formal English, but we had to be sure folks understood what I was trying to convey. We revised right up until the very end. In fact, on the day the book was to be shipped off to the printer, my editor sent an email suggesting word changes in the very first paragraph. 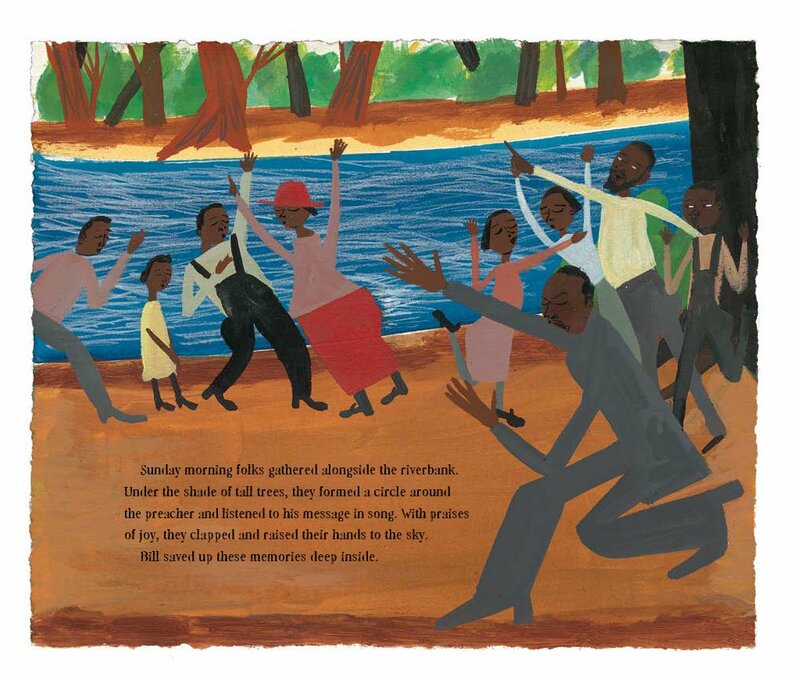 I had described Bill Traylor as an old man. However that description of him might have been offensive to some. We decided ‘elderly’ was a more appropriate description. My editor never told me what to write. She always made suggestions, but left the final decision up to me. Great editor she was. Tell us about being on the author side of the author-illustrator team. How did that feel? Did anything surprise you? Since you’re an artist, did you also give feedback on the illustrations? Or did you stay out of that process completely? I was fine with authoring the book and letting someone else create the art. In fact, that was my vision from the very beginning. It wasn’t until I won the New Voices honor that my editors wanted me to illustrate the story should they acquire it. Later it was decided a more naïve/edgy/gritty style would be desired. I am known for my many illustration styles, but I don’t do ‘edgy.’ We decided to go with another illustrator. I was thrilled they let me choose the artist. I didn’t play a part in the visual process at all, and I didn’t see sketches along the way. Yes, that annoyed me a bit at the time, but my editor knew best. Because I am an illustrator, and because I was so close to the manuscript, it would have been a challenge for me to step back and not make comments, not to try to direct the artist.That wouldn’t have been good for Greg. My editor was forward thinking there. Greg Christie did a wonderful job with the art. It’s perfect. Absolutely perfect, I love it. That’s what I think every time I see the book. Thankfully, Greg let me purchase a piece of art from the book. The cover! How do you feel now that your book is out? Did you do anything special to celebrate its debut? This video demonstrates how I felt. Ecstatic, yes. But in all honesty, I was busy creating ilustrations for my next two books. There wasn’t time to savor the joy. In June I’m planning a launch celebration at BookPeople here in Austin. I look forward to thanking friends who helped me along the way. That’s important. Find out more about Don’s work at www.dontate.com. I rarely read picture books but I have to break down and buy this one! Thanks, Edi. This is a book that will be enjoyed by kids and adults alike. It’s like a coffee table book for everyone. Dad- you’ve made me a proud daughter!!! Inasmuch as I don’t usually understand the term “edgy” in fiction, I laugh at the idea that there’s an “edgy” in picture book art! That being said, I do think that the sort of spiky, brightly colored people in this book bring movement and even more life to the words; they are a perfect match. Well done Mr. Tate, and congratulations! Congratulations Don & Gregory! Wishing you all the best! oh my goodness. this site is wonderful. I’m like a child inside of willy wonka chocolate factory!!!! i have learned so much and now to spread the word. each week i will highlight books from this site and authors. I now have a new feature for my blog. Thanks!!!! Don – Congratulations!!! Thank you for also sharing the story behind the book. Very instructional.